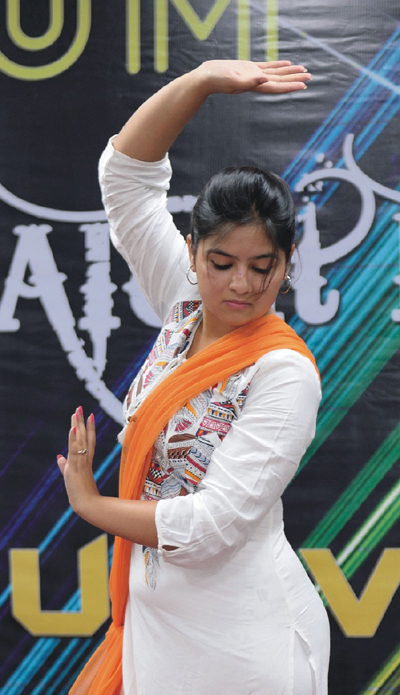 This dance club is to boost up the morale of students and to highlight the talent of dance and creativity. It provides opportunities to dance lovers to prove their talent and it is a good platform for them to have their artistic exploration. This club plays an important role in maintaining the positive environment in the university. By this Club, students get opportunities to represent DAV UNIVERSITY in various reputed organizations. Er. Naveen Bilandi, Assistant Professor, Computer Science and Engineering dept. Er. Ridhi Kapoor , Assistant Professor, Computer Science and Engineering dept. Vishal Dutta 11300648 B.Tech ECE 6th Sem. Sahil Bhandari 11300557 B.Tech CSE 6th Sem. CLASSICAL DANCE: Classical dance forms use basically the 'mudras' or signs of hand as a common language of expression and were originally performed in the temples to entertain various Gods and Goddesses. They were also effective in carrying forward the various mythological stories from generation to generation while entertaining the audiences. It eventually became a part of 'NatyaShashtra', with time, the classical dances evolved to include the expressions and themes from social life and experience. FOLK DANCE Folk dances are dances developed by groups of people that reflect the traditional life of the people of a certain country or region. Folk dance forms are practiced in groups in rural areas as an expression of their daily work and rituals. They are performed on religious, seasonal festivals or entertainment. WESTERN DANCEDance, along with music, has always dynamically expressed the spirit and personality of every culture. Modern western dance is part of this global language and its roots run wide and deep. They can be traced to the taverns of Ireland and to the ballrooms of Europe, to the Czarist palaces of Russia and further back still to the fluid tribal rituals of Africa. Representatives from all of these cultures brought their native dances when they landed in America. Widely differing peoples who had little or no exposure to one another gathered and danced on common ground.